TSW Short Jack Points for all year MINIs. Are you tired of not being able to fit your jack under the jack point? Or have yours fallen off? Or don't feel safe under the car with the plastic ones? These TSW Short Jack Points are Black anodized, machined from solid billet aluminum and a full 3/4" shorter than OEM. Our's protrude 5/8" past the bottom skirt, while the OEM protrudes a whoppin' 1-1/8". They are designed so they'll work with the OEM jack, too. These new jack points have hex cap screws mounted on the back side to keep them from turning in the frame rail. 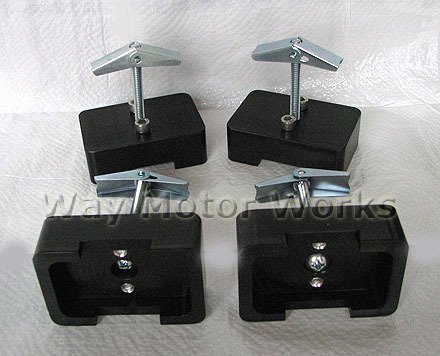 NEW jack stand notch, WMW improved these with a new larger notch to hold onto your jack stands. Mounted via 1/4-20 pan head screws and toggles... Install is a snap - takes about 5 minutes! Are they strong? Well, in a word, yes. They have survived countless car jackings over the years... And, they made it through a run in with a tire barrier at TWS, but the jack points stayed put! They've stuck around through a few offs here and there, along with countless cone killing runs which snap the OEM pucks off like nobody's business. Note - these jack points were not designed for use with the aero skirts. Note - you should still be using jack stands if you're going to be working under the car... That's smart no matter what you have to do under there, or what kind of jack points you have! Sold as a set of 4, enough for one MINI. I never really trusted the stock jack points. Plastic, even hard plastic, should not be whats stopping the car from crushing me. Easy to install, only took about 5 min per point. And the large notch really fits jack stands well. Every Mini should have these!